Birth of Harry Richard Bullock registered March quarter 1888 in Cannock. James Bullock (44, Agricultural Labourer, born Shifnal), his wife Mary (41, born Montgomeryshire), and their 4 children: Joseph (18, Farm Wagonner, born Shifnal), David Cand (6, born Albrighton), Harry Richard (3, Groom, born Albrighton), and George Morgan (1, born Slade Heath). 48 Regent Street, Woodsetton, Staffordshire. James Bullock (52, Farm Wagonner, born Shropshire), his wife Mary (50, born Montgomeryshire), and their 5 children: Joseph (29, General Carter, born Shropshire), David (16, Groom, born Coven), Harry (13, Groom, born Coven), George (11, born Coven), and Benjamin (8, born Coven). 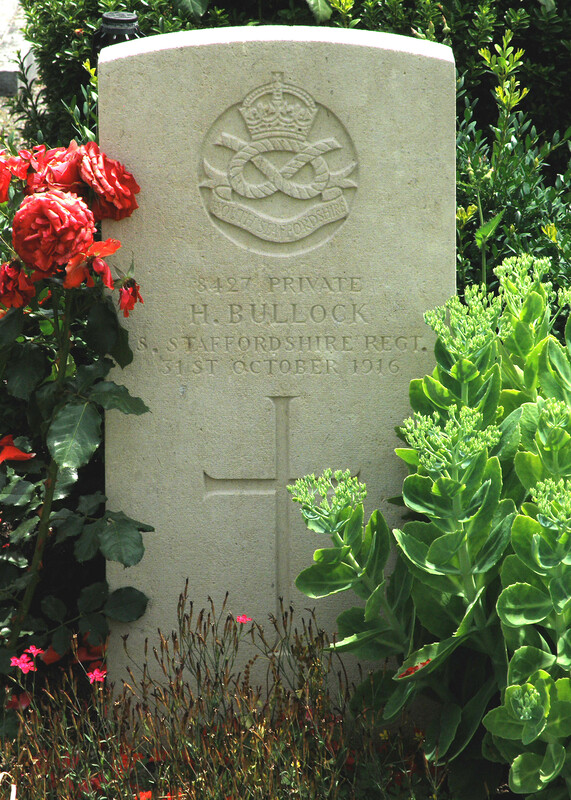 Harry Bullock, Private, 22, Single, born Brewood. During Harry’s time as a prisoner of war, his army pay continued to accrue. A total of £64/11/7d (64 pounds 11 shillings and 7 pence) was distributed to Harry’s brothers David, George and Benjamin in 1917, and a War Gratuity of £12/10/0d paid just to his brother David in 1919. Harry landed in Zeebrugge with the initial landing of the 1st South Staffs on 4th October 1914. In 1911 he had been a regular soldier in the 1st South Staffs, stationed in Gibraltar; it is likely that he was still a regular soldier at the outbreak of war. According to the German records with the Red Cross, Harry was captured on 30th October 1914 near Ypres (Selesbeeke). By October 1916 Harry was interred in Switzerland; this may suggest that he was wounded or sick as otherwise he would probably have been in a German Prisoner of War camp. Harry died on 31st October 1916, he was originally buried in Leysin, his grave was later concentrated to Vevey. Private H. Bullock, of the 1st South Staffordshire Regiment, who had a brother in Birmingham and another in Woodsetton, near Dudley, is a prisoner of war at Altdamm, in Germany. Writing to one of his brothers on December 9, he says: “Time is hanging very heavily with nothing to do and nothing to smoke. I should be pleased to receive a bit of tobacco, also a small parcel of anything eatable, such as cake or biscuits, or anything that will help to fill a big hole up. We are allowed to receive parcels of anything except newspapers.” Bullock also asks for a supply of notepaper, “as it is a terrible job getting any here, having got no money and no hope of having any”.